I then combine the information on travel routes with crowd-sourced safety data from two mobile applications: The first mobile application, SafetiPin , provides perceived spatial safety data in the form of safety audits conducted at various locations across Delhi. The second mobile application, Safecity , provides analytical data on harassment rates by travel mode. Together, the route and safety data allow me to assign a safety score to each travel route. Self-defence training initiatives such as SheFighter  in Egypt. Information campaigns like ‘Stop Telling Women to Smile ’ in several cities across the world. Aguilar, A, Gutierrez, E and Soto, P (2016), "Women-only Subway Cars, Sexual Harassment, and Physical Violence: Evidence from Mexico City ", Working Paper. Langton, L and Truman, J L (2014), "Socio-emotional impact of violent crime ", US Department of Justice, Office of Justice Programs, Bureau of Justice Statistics. Pain, R H (1997), “Social geographies of women’s fear of crime ”, Transactions of the Institute of British Geographers 22(2): 231–244. 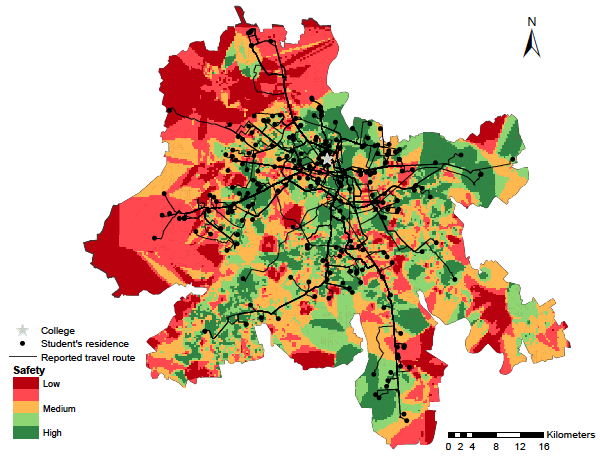 UN Women and ICRW (2013), Unsafe: An Epidemic of Sexual Violence in Delhi’s Public Spaces: Baseline Findings from the Safe Cities Delhi Program , International Center for Research on Women (ICRW).